Sourced from the best markets, farms and producers in the North East of England. At Scarlett's, chef Michael Lee creates modern British food in a comfortable, neighbourhood setting. The seasonal menu is inspired by ingredients sourced from the best markets, farms and producers in the North East of England. Combined with his natural ability in the kitchen, the result is simple and expertly crafted dishes that reflect Chef Lee's appreciation for the very best ingredients. Slow Roasted, Glazed with Brandy and Port Sauce. Sauté Potato Panache’ Vegetables. Chicken Breast Stuffed with Wild Mushroom & Brie, Wrapped in Bacon, Creamed Potatoes, with Mushroom Cream Sauce. 8oz Ribeye Steak, Portobello Mushrooms, Grilled Tomato, Goose Fat Chips, Nest of Onion Rings. 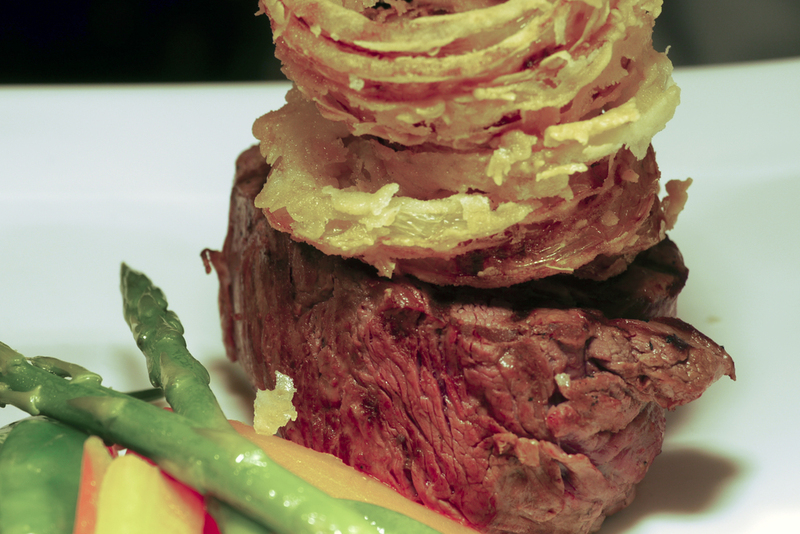 28 day Matured Centre Cut Fillet Steak. Goose Fat Chips Panache’ Vegetables and Nest of Onion Rings. Please note some products may contain Gluten, Fish, Shellfish, Eggs, Peanuts, Other Nuts, Soy Beans, Milk, Celery, Mustard, Sesame Seeds, Sulphur Dioxide, Lupin and Molluscs. As set by the Food Standard Agency. PLEASE SEE SERVER IF YOU HAVE ANY DIETARY NEEDS. Our Chefs are here to help. We cater for dietary requirements including allergies, gluten free and celiac. Just ask.